Life with Liv: Last minute Halloween buys. Looking for last minute Halloween buys? Why not pop over to your nearest Asda for all your Halloween needs! We have received some lovely samples this morning which Liv is kindly demonstrating! 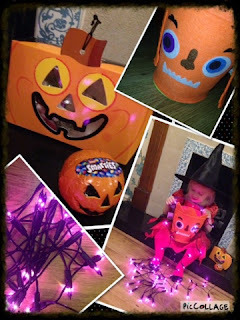 We were sent some lovely purple "Frightful" fairy lights, a small smarties pumpkin, a pumpkin box full of jelly sweeties and a fabric pumpkin trick or treat bucket. up lots of lovely treats. The treats will be demolished but the fairy lights are going to go in our newly decorated bedroom of the same colour, possibly in a fish bowl vase. 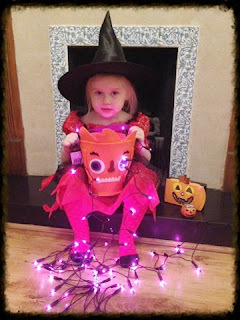 Disclaimer - we were sent some Halloween samples, however all opinion and images are our own. Asda wooden dolls house review. Chelsea Flipping Pup pool playset review. Finding the perfect gift is such a relief. Charlie gets a new collar and tag - review.